I’m illustrating a picture book about where children sleep around the world, with each spread depicting a different culture and living environment. The story is written by Rebecca Bond and will be published by Houghton Mifflin Harcourt in 2020. Here are links to posts about other illustrations for the book: South America, Japan, North Africa, North America, Holland, India, Iran and Afghanistan. To see a list of all my books, click here. 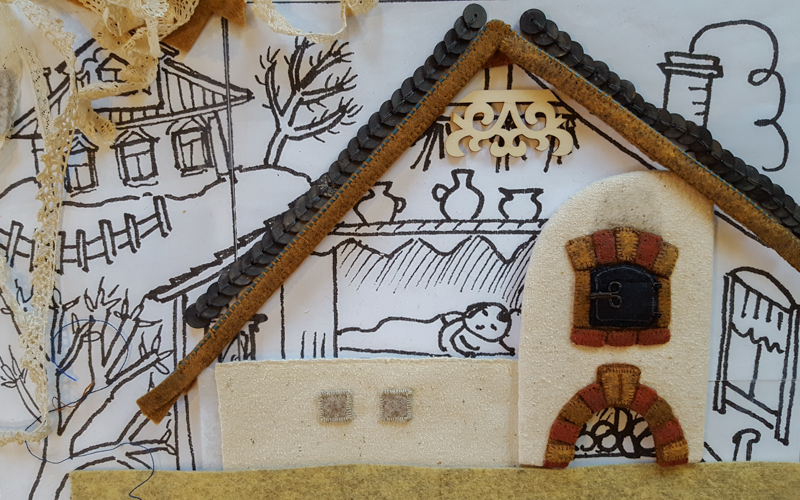 This scene shows the inside and outside of a house, with a traditional Russian oven as the centerpiece. Besides its use for domestic heating, in winter people slept on top of the oven to keep warm. I was first introduced to this kind of “stove bed” many years ago, when it was depicted in a magical stage set made for a Russian themed Christmas Revels performance at Sanders Theatre in Cambridge, MA. 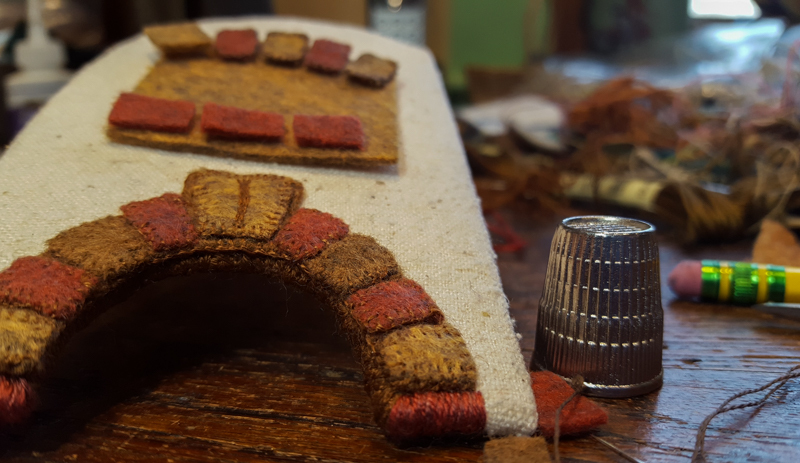 I started with the stove, using wool felt for the bricks and raw silk to convey the bumpy texture of masonry. 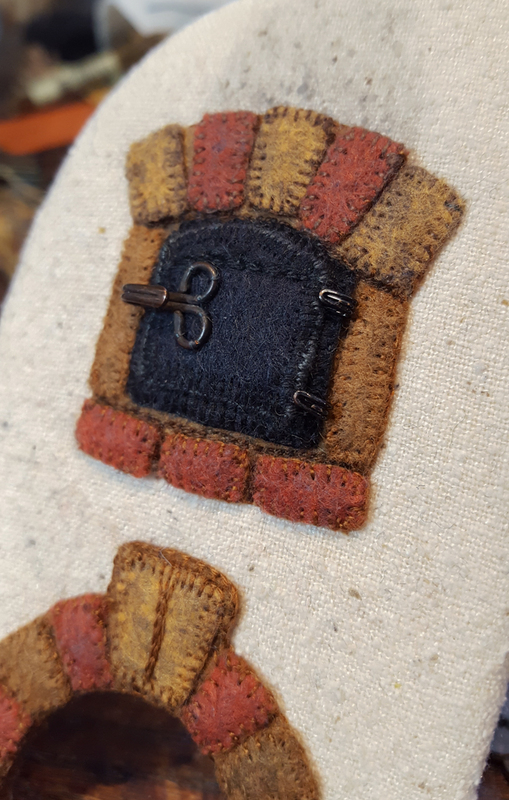 For some of the illustrations in this book, I’m returning to some tried and true techniques that I developed way back in the 70’s, when I made fabric pins. To make a film stove shape, I cut out a piece of acid-free mat board and covered it with fabric. As usual, hooks and eyes make size-appropriate hardware. 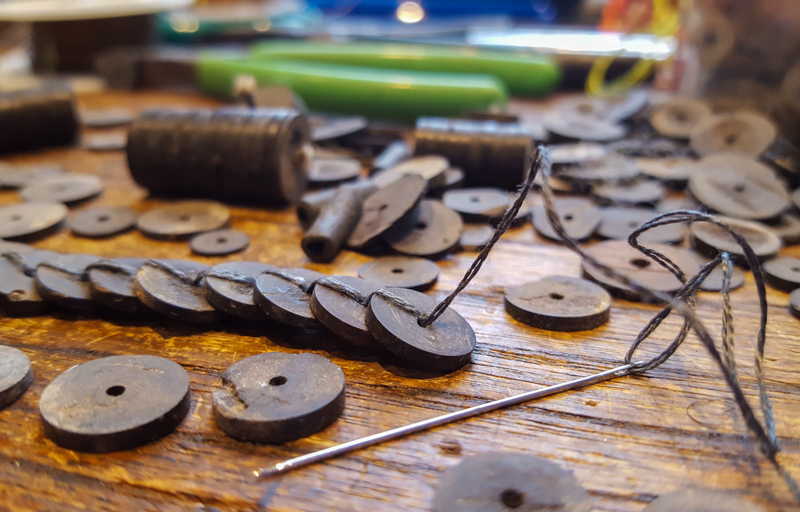 For roof tiles, I sewed together a string of bone beads that have been in my stash forever. 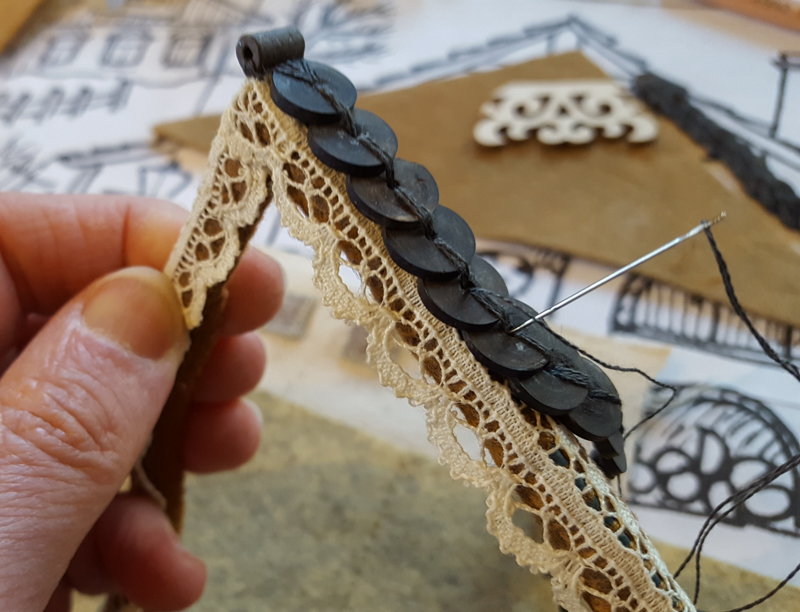 It isn’t often that I find a use for the lace from the vast supply stored in my attic. Most of the time, white lace comes across as lace. It’s hard to make it appear like something else, unless it’s dyed a color. But in this case, it could work as gingerbread style molding. 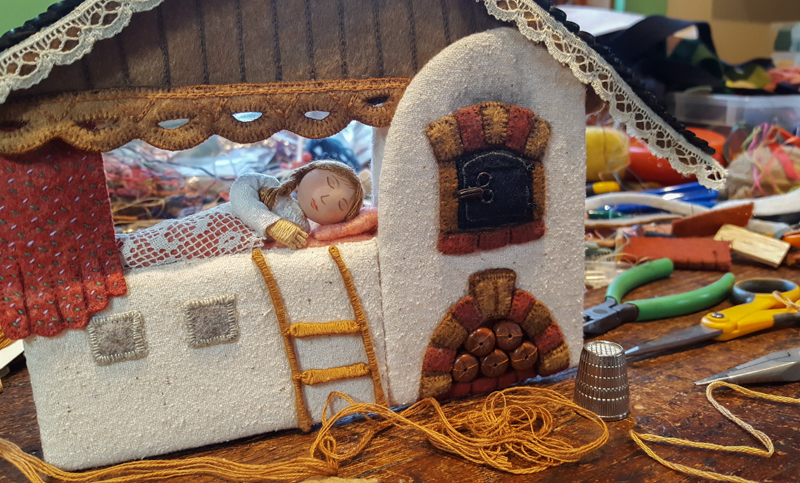 I made the head and half of the top portion of a sleeping child. I created a recessed area for the child to rest on and sewed the stove and rooftop together. It was solid enough to stand on its own. Stay tuned – more posts about this illustration will be coming! Thank you for sharing this Salley, as ever. 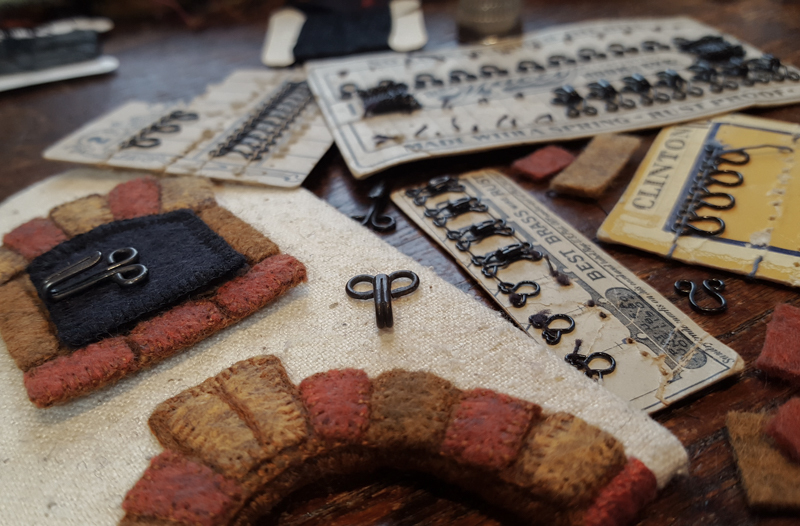 I was interested to read about where you started, with sewing pins. I so identify with this. Such pleasure in hand stitching and creating. Oh, Salley you must have an ENORMOUS stash of all kind of different things …. Yes, it takes a while to locate specific items, but I can usually find what I need in my stash. People sometimes ask where they can get certain materials and objects, but I can never remember when or where they came from. 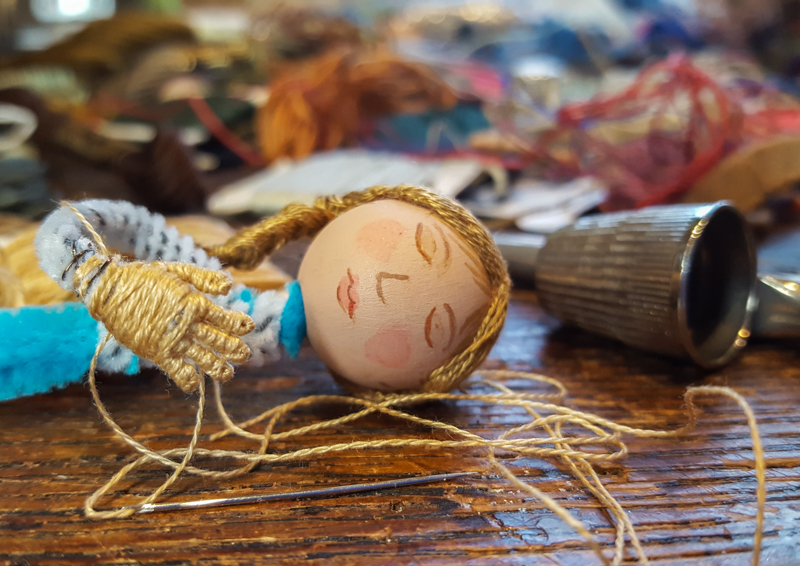 Recently, I talked to a group of college aged art students about using found objects in art. They seemed kind of shocked that I would hold onto some objects for 20 years before finding a use for them. I didn’t say that my collection is more like 30 or 40 years of accumulation! HA I know (and recognize 😉 (Man often says to throw things away if I don’t use them …. But you (and I) never know when you just need it (and can find it in your stash !!! Thank you for sharing these things with us. I love your creativity with common things.